The humpback whale, a six-day-old ten-foot-long calf, was photographed in the near-shore waters off Moorea, French Polynesia. Chris was on snorkel in 35' deep water and the curious calf approached to within 6-7 feet. Chris captured the calf on digital media and while this was continuing, the 50' mother came up from the bottom, spared Chris a swipe with her 10-foot-long-barnacle-encrusted pectoral fin as she moved the two of them further along the coast. 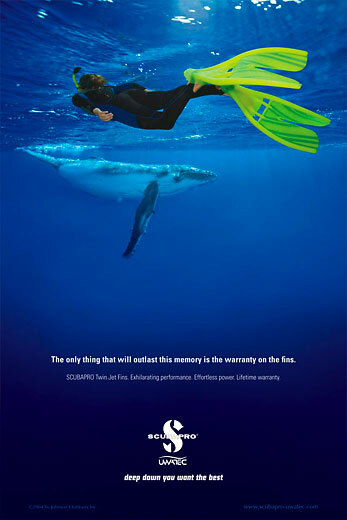 Full page ads and 24x36" point-of-sale posters for the U.S. market were produced adding a snorkeler with product fins shot in the wet studio, a custom-designed 8x16x12' outdoor cyclorama filled with 22,000 gallons of water. Water is kept at 90F+ degrees so the crew can work for extended periods comfortably. Quick reviews are done underwater, then the crew surfaces and reviews what has been done "tank-side" under a wet black cloth. Chris works in the wet studio on scuba. For fill light on this image, he used Ikelite 125 w/s underwater strobes mounted on long arms to a Canon EOS-1Ds 11-megapixel camera in a SeaCam housing. As typical for this kind of composite, direction of ambient light is matched and underwater lighting restores the color of the product.